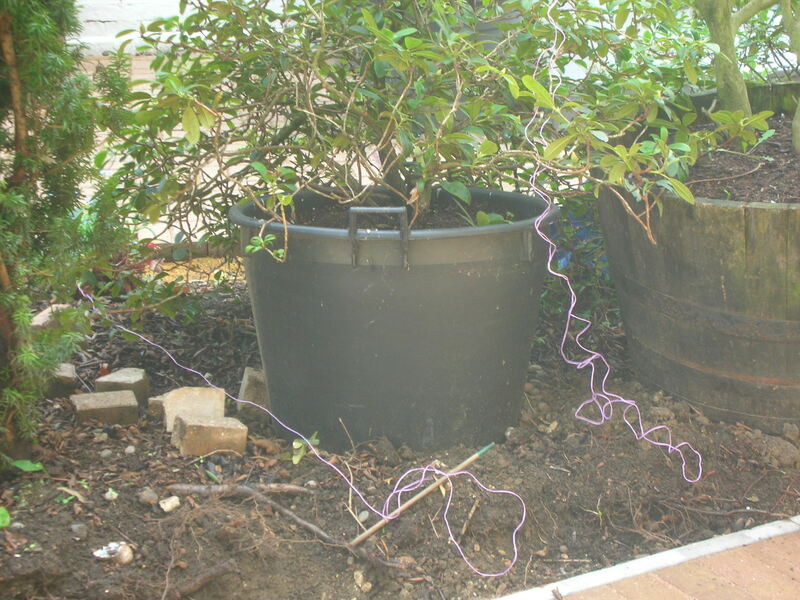 Couldn’t understand why the ball of purple string with bamboo sticks that I had been using to mark out the brick paths was in a bush, though the wind had been strong this morning. Then a (female) black bird appeared, string in beak, trying to fly off with it and getting pulled up short. She didn’t plan to give up soon. I was laughing too much and shouting at her to think of grabbing a camera, so this is only the aftermath. Either all our blackbirds are happier in human company, or this is the same one that built a a nest round the corner in the holly bush (I can see this nest and cannot see her on it) by the front window. She and partner are now hard at work in the small upright yew right outside my workroom window. They were still tugging at the ribbons of string an hour later. We have removed the string today as it was clearly a persistent source of frustration to them. I will try and find a quiet moment to see what they have actually made their nest out of. The one in the holly bush has a piece of plastic sticking out of it. I had no idea blackbirds were attracted to bright non-natural objects. This entry was posted in Gardens and tagged birds, nests by hilarycustancegreen. Bookmark the permalink. I love looking out my window next to my desk and watching the birds. I am also lucky enough to have two rabbits this year to watch as well. They bring fun and laughter to my day.